Rowing is one of the best full-body workouts around. The continuous rowing motion requires your entire body, so it boosts your heart rate, muscle engagement, and calorie burn! Rowing is impact-free and the intensity is completely user-controlled. 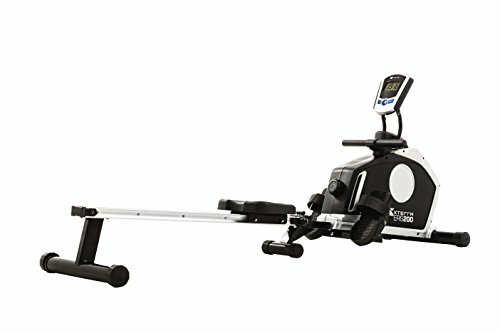 The XTERRA ERG200 Rower utilizes a dual aluminum track rail system, simple dial tension selection with 8 levels, and an easily adjustable console angle. The large contoured seat, padded pull handle, and pivoting foot pedals with wide Velcro straps combine for a smooth and comfortable workout for users of all fitness levels. Plus, you can fold it up for storage or easy transport. Start making waves with your workouts today on the XTERRA ERG200 Rower and exceed your expectations. • Assembled dimensions – L x W x H: 72” x 20.7" x 31.5"
• Assembled weight: 55.1 lbs. If you have any questions about this product by Xterra Fitness, contact us by completing and submitting the form below. If you are looking for a specif part number, please include it with your message.